LOS ANGELES, CA--(Marketwire - October 2, 2007) - With concern for the environment reaching a fever pitch worldwide, celebrities who are at the forefront of the green living movement are moving beyond endorsing hybrid cars to embracing eco-fashion. New York's recent Fashion Week featured "green" fabrics as well as vintage and recycled clothing, and it's no surprised that Hollywood celebrities are now toting environmentally friendly handbags. Eva Longoria, Heidi Klum, America Ferrara, Kate Walsh and Serena Williams own Half the Sky Design's "Rebagz™"; stylish and vibrant bags in a variety of shapes and sizes made from recycled juice pouches and nylon rice bags. 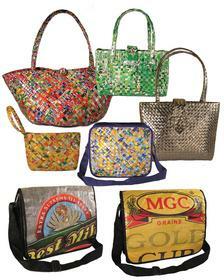 Rebagz™ are bright, durable handbags that currently come in two different lines. The woven line is made from the recycled juice packs that are cut into strips and woven together to create vivid styles for almost any occasion: The Tie Totes (both large and small) and the Four Corners Shoulder Bags are great all-around handbags; the Carry Anything Anywhere Bag can be used as a commuter tote or shopping bag; The Bringing Up Baby/On The Go Bag has compartments so it can be used as a baby bag, a beach bag, a gym bag or an overnight bag; the Mini Bag can be used for cosmetics or even worn as a wristlet; and the Travel and Book Bag is a favorite for toiletries or for children to transport toys and games on trips. The nylon rice bag line includes the Messenger Bag, which can fit a laptop, has compartments for pens and pads and an outer zipper compartment for quick access; and the Sport Pouch is lightweight and good for traveling since it can hold your passport, camera and other items you need in a hurry. The Messenger Bag and the Sport Pouch are popular among both men and women and bear the designs and parts of the words and logos from the rice bags, which are designed to capture attention in the competitive rice market in the Philippines. The non-profit Sustainable Technology Education Project (STEP) defines eco-fashion as clothes "that take into account the environment, the health of consumers and the working conditions of people in the fashion industry." Stevens-Heebner -- who named her company Half the Sky Designs for the adage, "women hold up half the sky" -- simply calls it "the next evolution in style." She initially planned to make her designs out of fabric. "I met an amazing group of women using juice packs to make this vivid weave," she says. "That was the end of the fabric idea." She found the recycled weave to be far more interesting visually, and felt the same way about the beautiful rice sacks she saw in the Philippines. "They create a much more fashion-forward design," she adds, "as well as an eco-friendly one." With a degree in ancient history from Cornell University, Stevens-Heebner views our current ecological state as a challenge we must meet. "I've learned through my design work that we need to look at everything with fresh eyes and let it inspire us," she says. "That's what we do at Half the Sky Designs. We like to say that we're saving the world...one handbag at a time." Rebagz™ suggested retail prices range from $24 to $90. For more pricing, ordering or additional information, call (818) 907-8695 or visit www.halftheskydesigns.com.